Evelyn (ioensis Purpurea) (Malus 'Evelyn' syn. 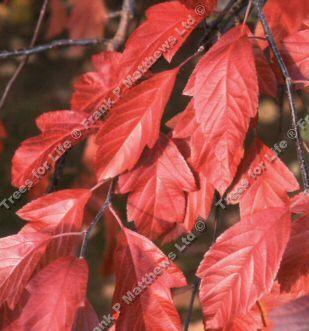 Malus 'Rubra') is a a truly spectacular purple-leaved form of the ‘prairie crab' with large lobed dark purple leaves that turn a stunning orange-red in autumn. The flowers are a real attraction, being a large single pink and fragrant. Originally introduced in North America. A fast growing medium height tree, so expect a height of up to 6 metres after 10 years.